We explain what cube numbers are and how the concept builds on prior knowledge of square numbers. A cube number is a number that is the product of three numbers which are the same. In other words, if you multiply a number by itself and then by itself again, the result is a cube number. Cube numbers can be represented visually as 3D cubes of single, unit cubes. To write the mathematical formula for cube numbers we add a small 3 next to and above the number, for example: 23. Children start to learn about square numbers in Year 5. 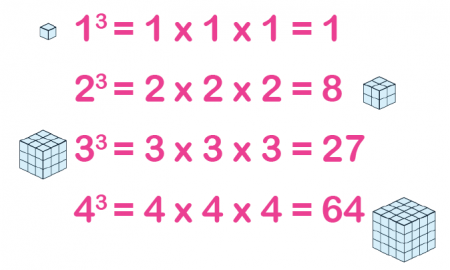 This learning is then consolidated in Year 6, when children are expected to know the notation for both square numbers (²) and cube numbers (³). They may be given the above diagram and asked to work out what the next three cube numbers are. In this case, they would be expected to realise that the next cube number is the result of 5 x 5 x 5, which is 125. The one after that would be 6 x 6 x 6 = 216. Often in 11+ tests and secondary entrance exams, children are given a sequence of numbers like those above, and required to work out what the pattern is and how to continue it.